Camilla sits inside a mockup Soyuz capsule at Johnson Space Center in Houston. Let me tell you about an ambitious rubber chicken. Her name is Camilla Corona SDO, and she's the official mascot for NASA's Solar Dynamics Observatory. 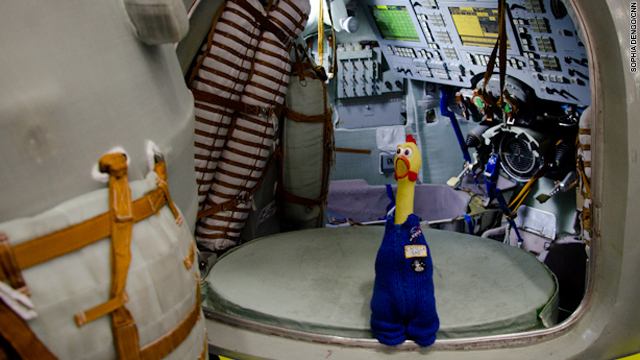 You may be most familiar with her as the bird that a group of high school students sent to the edge of space in March. For Camilla, that flight (intended to study a solar radiation storm) was just part of her job promoting science, technology, engineering and math (STEM) education among students, especially girls. Oh, and let's not forget that her trip could be considered part of her astronaut training. Yes, you read that right. Camilla Corona, along with her mascot duties, is training to fly in space. She wants to visit Little SDO, her best friend, who is currently on a mission to observe our sun. A flight to the International Space Station is on her wish list, too. Camilla certainly has plenty of help in achieving her goals. Among her supporters are a slew of NASA astronauts, politicians, STEM students, famous faces and space geeks, including a woman in her 90s who makes sure she has the appropriate attire for her many roles. For example, for her flight into the solar storm, Camilla was outfitted with a familiar white spacesuit, complete with bird-sized helmet. Most of the time, Camilla sports a blue flight suit festooned with patches and pins - appropriate, as she travels around the country visiting various NASA centers as well as her friends in the space, science and education worlds. Recently she's added a trip to Russia to her travels: NASA astronaut Reid Weisman escorted Camilla to Star City for Soyuz training. Keeping up with Camilla's whereabouts can be exhausting, so it's a good thing that this rubber chicken is a master of social media. A peek at her Facebook page reveals the extent of her travels and really reinforces her mission in life: to reach out to and connect with people, especially kids, to encourage them to study, to be involved in STEM, and to remember that space and space travel, while rife with challenges, is fun. Want to keep up with Camilla? She has a Twitter account, a Facebook page, and a Pinterest account, where she posts interesting photos of the sun and other spacey topics. You can also check out her bio here.